Professor Dawkins said it was now possible to go to a dinner party and assume no one was religious. He’s certainly not winning any war against Islam, for Britain’s Moslems are a confident minority, building more mosques, and demanding Sharia law for their community (for now). To speak disparagingly of the Moslem faith in this country is very politically incorrect. A pathetically ineffective, feminised national church, where there is no concept whatsoever of Biblical fidelity. They are arguing among themselves about women bishops and gay clergy, and their Christian witness to the nation is little more than liberal Marxist philosophy. Modern so-called ‘Evangelicals’ – weakened and enfeebled by years of ‘celebrations’ with little or no teaching content and impoverished doctrinal awareness. Charismatics who interpret God’s Word through the lens of their own experiences and feelings. Happy-clappy churchgoers with a complete lack of Biblical discernment. Britain’s version of national Christianity has been a pushover for aggressive atheists like Dawkins, who batter down their opponents with bitter invective and very little real rational argument. Even some of those who should know better, – who should be part of the Reformed tradition, and who subscribe to the Westminster Standards have abandoned the teaching of Christian Doctrine, abandoned the teaching of the Shorter Catechism in favour of ‘how-to’ therapeutic talks at ‘seeker-sensitive’ services. However, there is one group against whom Dawkins and his ilk have not inflicted defeat and never will. They are God’s Elect – the invisible, true church, His People. I have always believed that God’s redeemed people, His Elect are, and have been for many centuries a remnant, – a small number of people in many different denominations and assemblies, who have repented of their sins, and turned to The Lord, are searching His Word and clinging to Him in these days of national decline. Their trust is in The Lord, and they shall never be forsaken or defeated. Ultimately, Dawkins himself must also repent, for a day will come when he will stand before God in judgement, and will give account of his life. On that day, his defeat will be final and irreversible. I feel sorry for this man, and we should pray for him, for his atheist arguments indicate nothing more than his own sinful rebellion against God. Ultimately his war is not against either religion or Christians. It is against God, and its a war that he can’t win. One day, every knee shall bow, and every tongue confess that Jesus Christ is Lord, and that includes Dawkins. 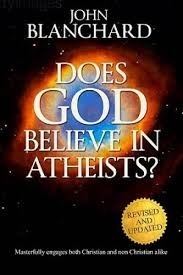 For those Christians who care… Care about the state of the visible church and care about this nation’s slide into immorality, and who want to take a stand against men like Dawkins, may I suggest that you obtain a copy of ‘DOES GOD BELIEVE IN ATHEISTS’ by John Blanchard. You can obtain a copy from ICM Books at a discounted price, and with free postage in the UK. 2 God looks down from heaven on the children of man to see if there are any who understand,who seek after God.